I never knew Aubrae Gunderson. She died on September 26, 2005. It was a tragic accident; she was struck by a car while running with her cross country team at my local High School. Right in front of the school. They renamed the road in her honor, and there’s a plaque on the side of the road where she was killed. There’s also a race held in her honor every year. I ran that race last November. Again. 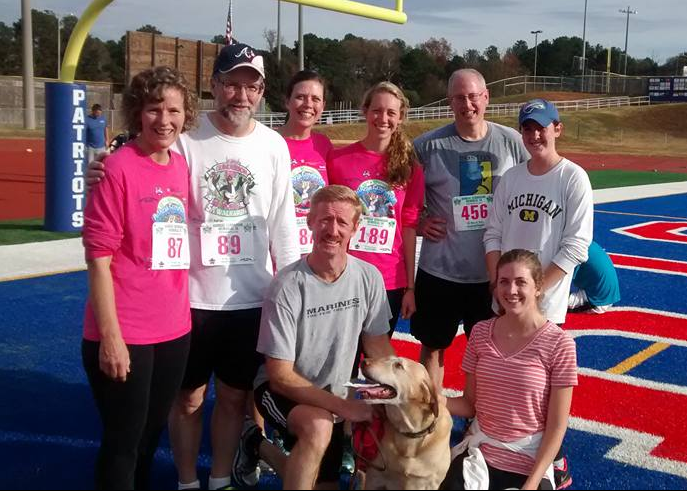 That’s me, the sweaty guy on the right wearing #456, with a group of my friends at the end of this year’s race. The girls in the picture went to school with Aubrae. They also run the race every year. The race runs past the site of the tragic accident and ends, appropriately, with a lap around the high school track. The race is MC’d by her parents, Dan and Eileen, whom I admire greatly. It’s been held every year since her death, with the money going to a scholarship that’s awarded to an athlete from the school who meets certain attributes. I don’t know about you, but I find the “E” chilling. Her Dad doesn’t know me, but he made a point of coming up to me at this year’s race and personally thanking me for attending the race in honor of his daughter. As I run the race on the roads once run by Aubrae, I think. I think about…. ….the girl I never knew. ….the life that Aubrae didn’t get to live. Just as I’m inspired by Aubrae, I’m inspired by Joe. Joe’s an amazing guy. Honestly, he’s the most upbeat, positive, encouraging man I’ve ever met. He was a neighbor of mine when we lived in Ohio, and became a role model for what I want to be in my later years. He’s in his late 70’s now, and I haven’t seen him in a few years. I suspect he’s still got the energy of a 20 year old. I suspect he’s still running. I suspect he’s still smiling. He cut off his finger when he was using a log splitter while in his early 70’s (I told you he was energetic). “Ah well”, he said, “That finger served me well for more than 70 years, I guess I can’t complain.” In fact, I’ve never heard Joe complain. He takes his dog into nursing homes. He guides hikes at a nearby National Park. He runs several times a week in a local running club. He’s always upbeat. He was running the JFK Ultra 50 mile ultra-marathon into his 70’s. “Yeah, but I walk up the hills now,” he says. In 2009, my town was having it’s first annual 1/2 marathon. “You want to run the 1/2 marathon with me?” Joe asked. “Ah, Joe, I haven’t been training for a 1/2 marathon. 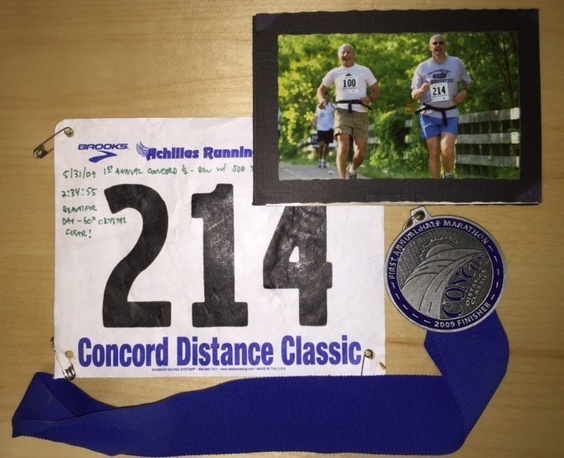 I can barely run a 5k, let alone a half marathon of 13.1 miles,” I weakly replied. “Come on, you’re going to tell a 72 year old guy you can’t keep up with him? I run slow, and I walk a lot,” came his reply. The picture of he and I running together is one of my all time favorite pictures, and hangs above my desk in my home office. I love the smile on his face in that picture. Typical Joe. We’re 12 miles into the race, and he’s smiling. At 72 years old. Doesn’t he look great?! The last 1/4 mile of that race was incredible. Joe’s a legend in his running club, and the entire running club ran back out after their finish to run the final stretch with Joe. Joe’s a Rock Star. I was a Groupie. It was awe-inspiring. After the race, I told Joe my goal in life was to beat his 1/2 marathon time of 2 Hours, 34 minutes and 55 seconds when I’m 72 years old. (He’ll be 98 years old by then, and I wouldn’t be too surprised if he decides to run it with me). 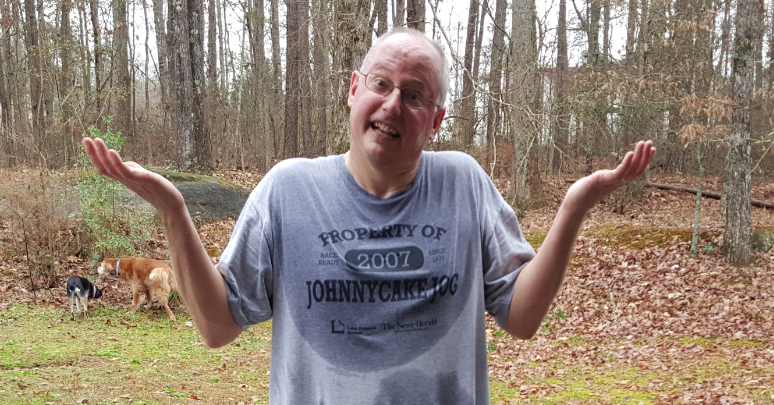 In December of 1995, at the age of 32, I ran my first mile (full disclosure, it took about a week on the treadmill before I could reach the mile mark without walking). I don’t run fast, and I don’t run far (anymore). I also walk a lot more these days, especially up the hills (Thanks, Joe!). I go through the inevitable cycles, sometimes not feeling much like running, but running nonetheless. I don’t time my runs anymore. I don’t care about my pace. Sometimes my ankle hurts. I don’t want to suffer the negative consequences of a sedentary life. I sit at a desk most days, and can’t wait to BREATHE real air during my lunchtime runs. Running provides a time-efficient option to get some exercise. I choose to enjoy running, even when I don’t. I want to have an active retirement, and be able to do what I want to do. Aubrae never made it past her Sophomore year in High School. I’ve been blessed with a wonderful life. I choose to enjoy that life. I would prefer to enjoy it for many, many years. How I evolve through that life is, at least in part, up to me. Running is the path I’ve chosen to increase my odds at a long and healthy life (like Joe’s). Aubrae and Joe are my inspirations. Find something you want to do more of (or less of), then find things in your everyday life to provide the ongoing inspiration and motivation to succeed in your goals. Look in the everyday places. Be creative. Be consistent. Find something that provides you short-term inspiration, and something that supports a longer term goal. Don’t just make a resolution and be done with it; to truly succeed, seek inspiration. Aubrae motivates me in the short-term (to run her race, every year). Joe motivates me in the long-term (to run a half marathon when I’m 72). When I’m 72, I want to be able to run a half marathon. I want to beat Joe’s time.